I think I’ve turned a corner on my academic work. It’s taken me nine months of struggle to finish up loose ends left dangling from my dissertation exile, publish a couple of articles, invent a few new classes for the job I started immediately after finishing the Ph.D., start new work for conferences and grant proposals, make travel plans, plus a host of other teaching and administrative stuff that’s par for the course. But I’ve done it. I don’t want to say I’m out of the woods, but I feel that for the first time in a few years, my schedule is manageable and not subject to change at the drop of a hat, and I’m very, very much looking forward to having a little breathing room to do my research and well, you know, live. Witness: I dusted a lamp yesterday and felt infused with pleasure. Because I actually had 2 minutes to dust a lamp and nothing but the immediacy of lamp-dusting on my mind. The zen of dusting lamps. Lame, huh? Spring and summer are going to be quite busy here at Raccoon Tree Acres, but I only have a few deadlines. The work I did this winter on proposals, conferences, and teaching my research subject makes them easier to meet, too. I’ll be going to Maryland to visit the archive of a cantankerous modernist, London to read the papers of a sexologist, Prague to talk about dirty James Joyce, and Zurich to expound upon the literary fruits we know and love. (Do I dare to eat a peach? Why yes, I do.) And we’ll have time to visit family and friends, too, in between. We haven’t seen most of our family in years, so these are much-anticipated events. I’m planning to blog the delights of food in all these places, of course. But for now, I’m quite pleased at my lamp-dusting-local self and the drunken glee of Eugene on the sunny days in spring. Our farmer’s market is glorious right now. Our organic farms make the most of the plants they grow and sell the thinnings of their rows. 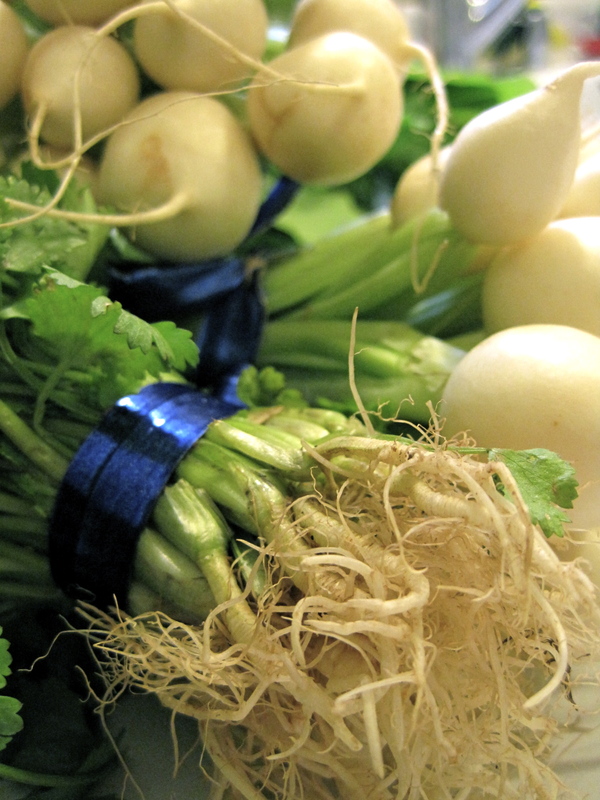 For the spring vegetable supper below, I bought new potatoes, big fat bunches of the sprouting tips of crucifers (kale, brussells sprouts, broccoli), tiny carrots and French radishes, turnips the size of a quarter, and the biggest bag of deep red rhubarb ever. 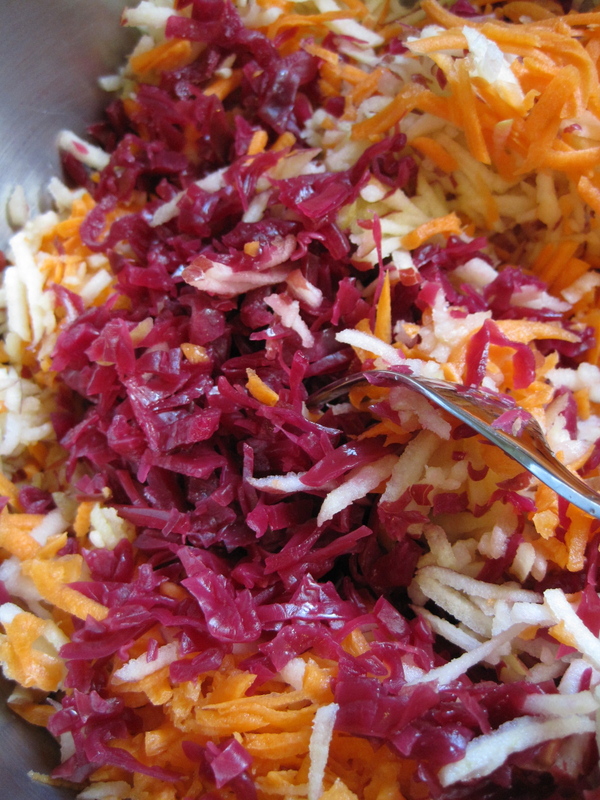 I’ll fess up to erring on the side of too much butter, cheese, and cream for the gratin and butter-braised vegetables. No one complained, though. 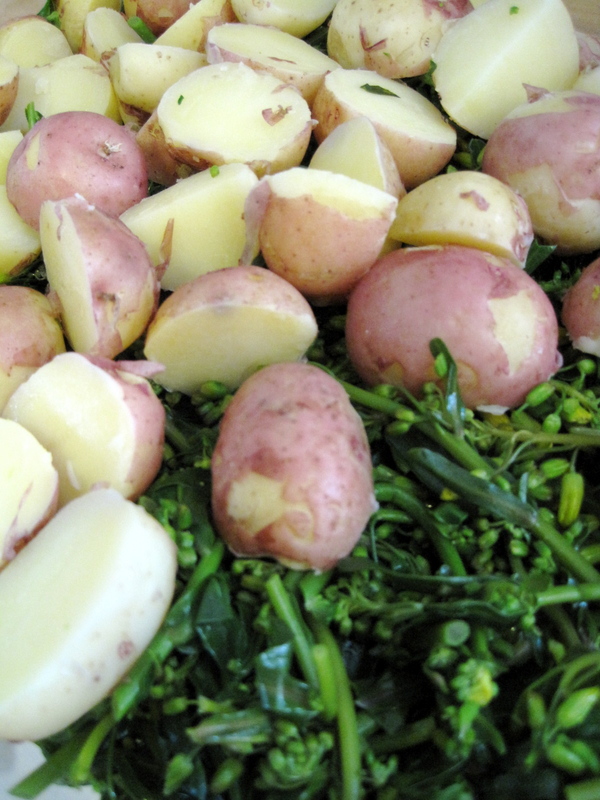 The gratin was assembled by blanching the brussells sprout greens and boiling the potatoes, then layering both in a Pyrex dish with nutmeg, pepper, and a handful of chopped sprouting onions, leeks, and garlic that I had culled from my allium bed that afternoon. Cream in which thyme and savory had been soaking was poured over the top, then a fontina-like Italian cheese whose name I can’t recall was grated over the whole shebang. 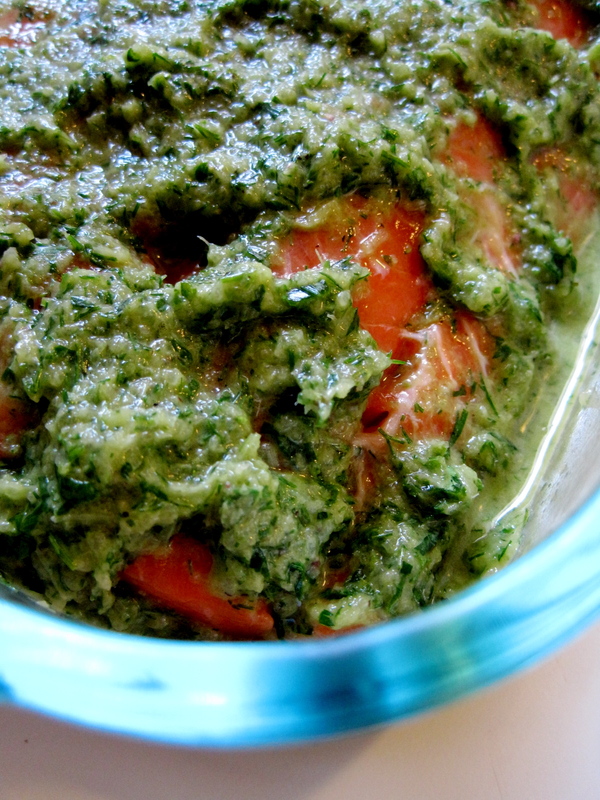 For the chimichurri marinade for a gorgeous piece of chinook salmon, I used the tender fronds of my caraway plant, fennel fronds, thyme, savory, lovage, celery, onion, lemon, and olive oil. We grilled the fish on alder planks, so it was a lovely combination of fresh green and live smoke. 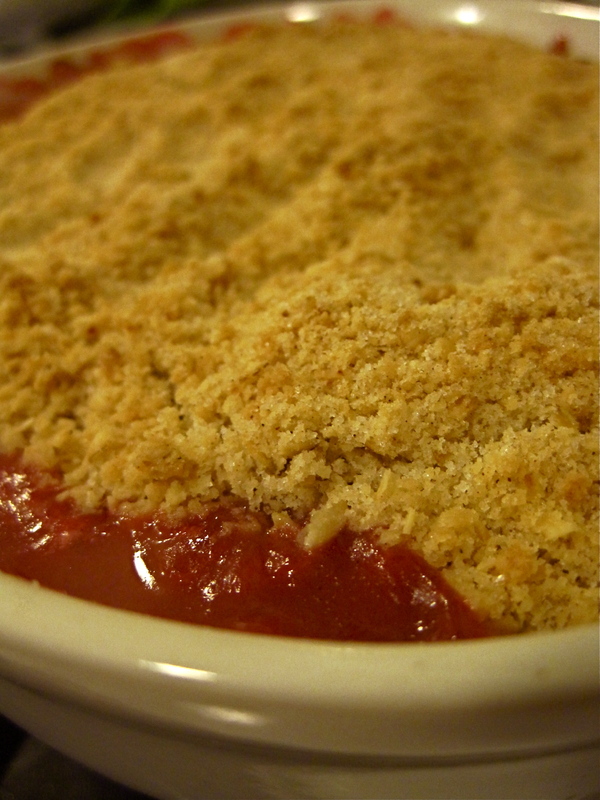 And the rhubarb? Well, that was a no brainer. I used some of my homemade granola to fancy up a crumble topping, and tossed the fat pieces with a bit of vanilla sugar and Clear gel food starch to control the juice. The Master Gardener Plant Sale will be held TODAY at the OSU Extension Service, Lane County, 950 W 13th Avenue, Eugene (in front of the fairgrounds). Yes, today: Saturday, April 24, 9 a.m.-2 p.m. Come early for best selection. There will not only be great plants and book and bake sales, but also some deliciously whimsical garden art and a silent auction featuring gifts and services from local businesses. Last year, I won a Friendly Street Market gift certificate, but I secretly coveted the sacro-cranial massage won by one of my friends. Don’t miss it. All proceeds will go to support the Master Gardener program in Lane County…and you know we need the funding! Drumrongthai, a new Thai food cart perched on a triangle of pavement at 6th and Blair, somewhat awkwardly across the street from Chao Pra Ya, is opening today (ETA: or did it? I went by around 2:30, and the place was closed). There goes the neighborhood! I drove by yesterday to see operations on the finishing touches, and the cart is adorable, all colorful and whatnot. You can bet I’ll check it out. More Asian food in Eugene!! 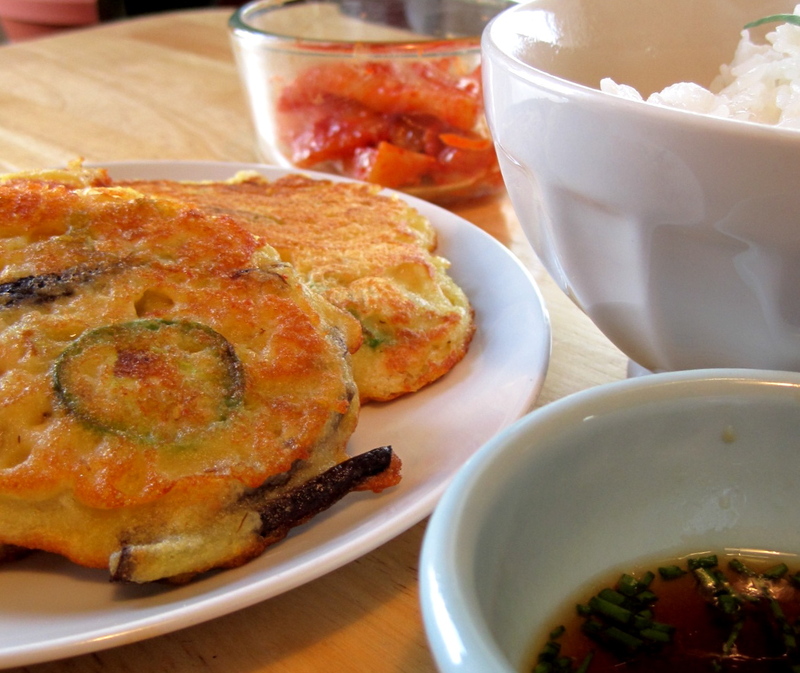 Speaking of which, I spent most of the week stuffed with Korean pancakes that owner June Jang of Café Ari Rang made especially for me when I told her my husband loved the things. We had a seafood-green onion pancake, simple fried fish pancakes, and some excellent mung bean-hot green pepper-fiddlehead fern-onion pancakes. They’re not on the menu, but perhaps, just maybe, quite possibly, we could convince her to put just one — like a kimchi pancake or a green onion pancake — on the menu in the future? Please?! She did tell me that there will be some spring specials coming soon. And also coming soon…a semi-permanent block of food carts at Kesey Plaza. All you Voodoo Donut lovers rejoice — something to cut the sugar! Unless things have changed, Field to Table/The Nosh Pit and others will be opening up some more delicious street food options as of May 15. A small voice whispered “Cuban” to me, but I cannot confirm or deny what kinds of food might be occupying the space. Benedetti’s Meat Market in Springfield offered an irresistible special on their Facebook page yesterday: a “five dollar footlong” made of trimmings of tenderloin from a special order. 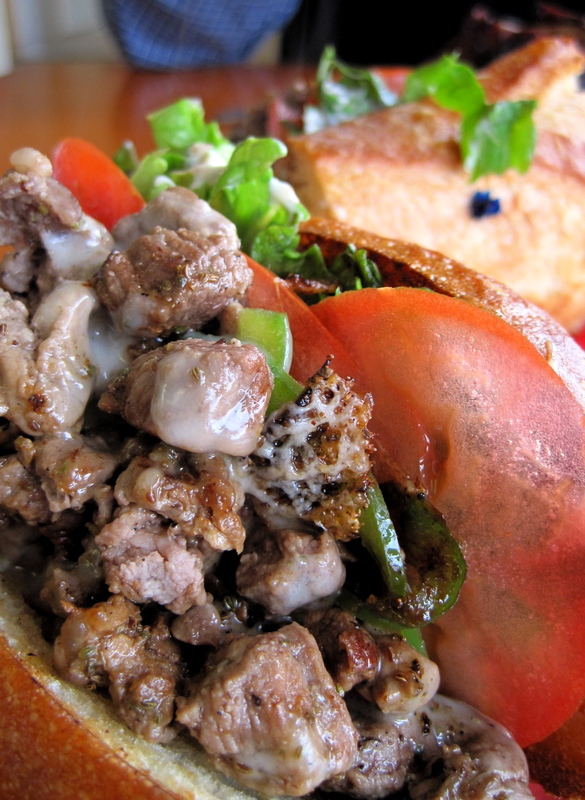 It was the best non-Philly cheese steak I’ve ever had, stuffed with meat, melting provolone, and aïoli slathered on a fresh roll from…um…one of our amazing local bakeries whose name I don’t know. Also special: Facebook discounts on their grass-fed ground beef. Yet another reason to keep up with your social networking! 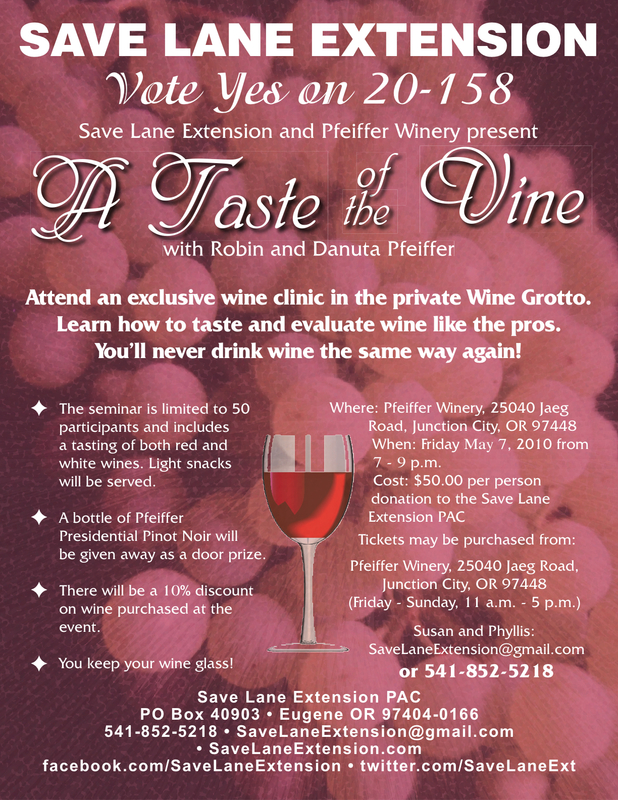 I spent an amusing evening at Pfeiffer Vineyards a couple of weeks ago for a fundraising event for Save Lane Co. Extension. The wine, available only at the winery, is quite interesting. I’m not a wine connoisseur by any means, but I do know that small, quirky wineries tend to make wines that develop and mutate in sometimes fantastic ways that make them seem wholly unlike their varietal cousins. Their viognier is strange and seductive, with a nose of (of all things!) banana. I couldn’t resist and bought some of their lovely pinot gris (pear all over the place, with melon) on the spot. The pinot noir is more of an investment, but it’s also very, very good. Was even more amused to see the Eugene liquorish ‘zine Boozeweek is back, and includes a review of Pfeiffer…was nice to read just a few days after I visited! Ah, memories. Let’s wine for just a moment longer. The 2009 Sweet Cheeks riesling is shaping up quite nicely. We had some as part of the Spring Winemakers dinner last night at the winery. I was disappointed not to have the tasting notes supplied by the winemaker himself, but he had arrived back in town from Australia that day and was feeling justifiably exhausted. I’m a big fan of Sweet Cheeks riesling in general, but this vintage seems especially good. The dinner, which featured Anderson Ranch lamb, tiny duck confit wonton cups, Rogue Creamery blue cheese mousse-stuffed peppers, and a perfectly prepared havarti-potato gratin, was very well done. Their chef is great, and I’m so glad she’s offered her services to the winery for these dinners. I’d been looking forward to the event for weeks, and they didn’t disappoint. And on the other side of the dining spectrum: french fries at Humble Beagle. We eat there regularly, but I usually opt for something other than the burger and fries, so I hadn’t tried them. And lo, i did, and they were good. Very good. Thinly cut with a mandoline or similar blade that makes perfect, thin, matchstick-y batons, the fries are topped with just a bit of European-style coarse salt, parsley, and raw garlic. I think their fryer is a bit too hot, so the fries tend to be a bit browner and not quite mealy inside as I like, but there is a certain pleasure in a slighly underdone fry to remember the potato it once was. Burger and brew special on Mondays: $9. Eugenia Bob says check it out. Eh: the service at Perugino. We really don’t need the attitude, thanks. Love the music, though. Probably the best in Eugene. Right tunes, right volume. Eh: another vegan, another burger joint. This time both. The pictures look fantastic, don’t get me wrong, but I’m so tired of the burger joints, and we’re full up on vegan joints. So…eh. Get out there and garden, Eugene! everything’s coming up rose geraniums! A by-product of any rhubarb cooked over the stove is the shocking pink syrup I wrote about last year. 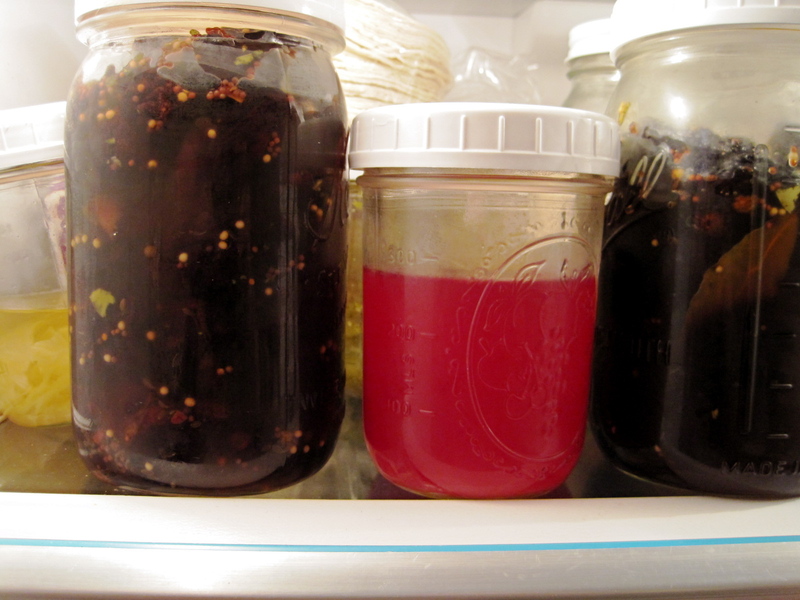 Here’s my new batch, making friends with two kinds of pickled plums and some pickled ginger in my refrigerator. Hullo there! 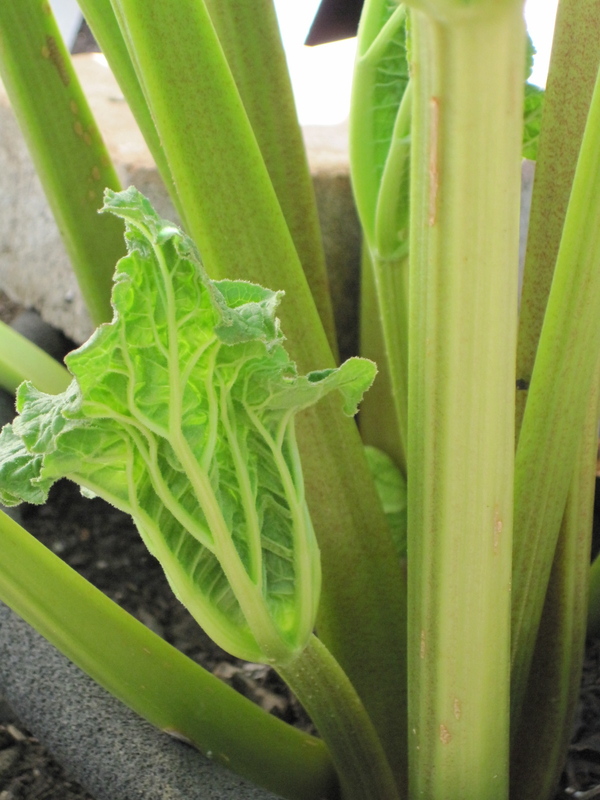 The problem is that most of the rhubarb that flourishes here in the Willamette Valley is the green-stalked Victoria rhubarb (below). When mixed with June strawberries, there’s no problem with color, but bright green rhubarb pie or crumble seems a little, well, less festive. 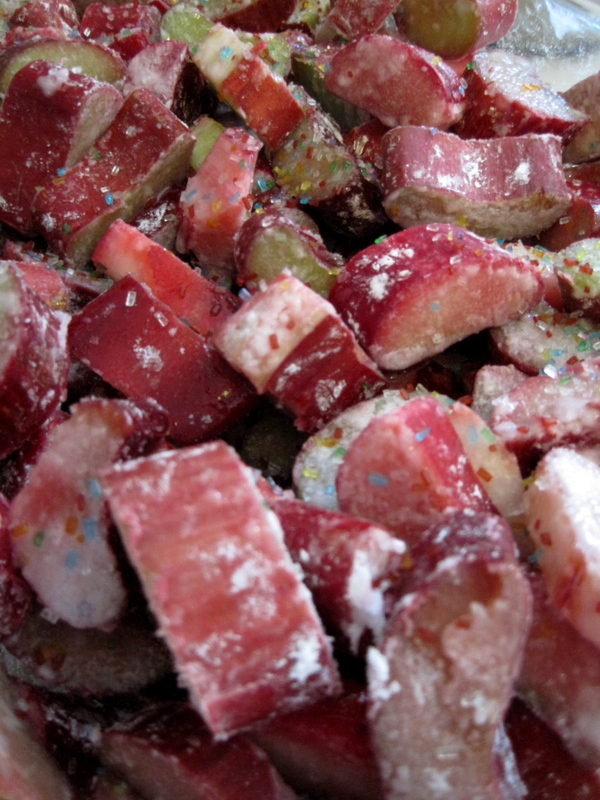 So if you can, grab up or pick hefty red rhubarb stalks when you see them. I bought mine at Groundworks Organics at the farmer’s market last week, and made some syrup with vanilla sugar we made at our OSU Extension Master Food Preservers ‘Gifts in a Jar’ class last winter. Just before pouring the sweet and sour concoction into a jar to cool, I swished a few rose geranium leaves in the syrup for an unusual flavor. 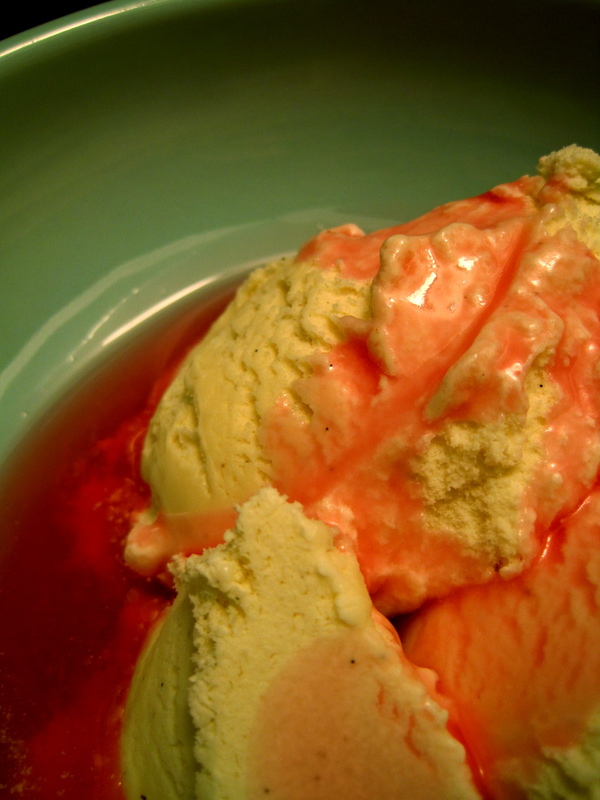 My problem is that I can’t stop eating my rose geranium-vanilla rhubarb syrup on ice cream. I want to use it for crisp gin cocktails with a garnish of rose geranium flower. Or maybe to spice up a fresh strawberry fruit salad. Or maybe to drizzle over some sour cherry claufoutis. Will it last, though? Tune in next week, same bat time, same bat channel. Now’s the bat time, by the way, to start shopping for scented geraniums. I fell in love with the classic variety ‘Attar of Rose’ last year, but all my geraniums — peppermint, lemon balm, cinnamon, rose — died in the freeze. The geranium lady at the market told me she lost most of hers, as well. Even ones that were 10 years old. A shame. 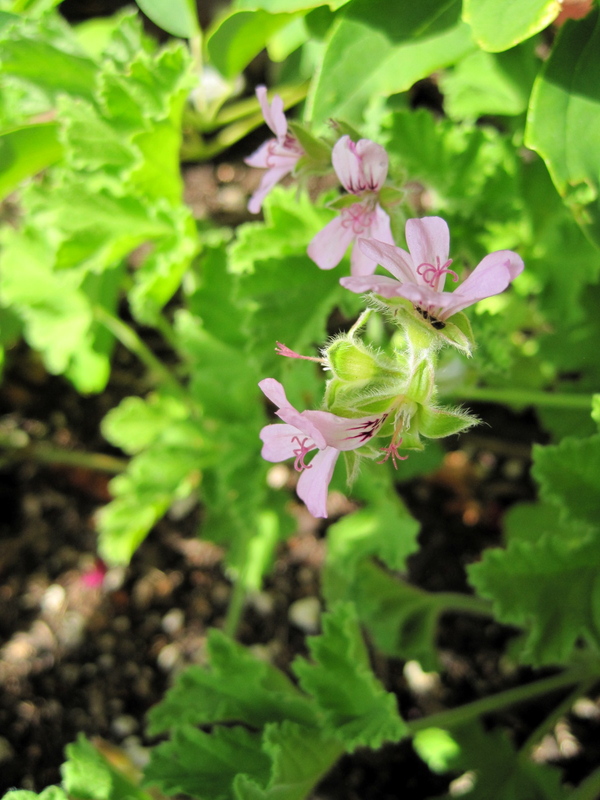 Rose geraniums make a wonderful simple syrup on their own, without rhubarb. I seem to recall I made a simple syrup last year with local Pinot Gris and rose geranium. If you can bring out complementary flavors in your chosen wine with the rose, all the better. Other ideas? You might try submerging a few leaves in a quart of sugar to make rose-scented sugar for baking, or even make a pound cake with the leaves imprinted on the top of the cake. We’re pretty sure that my friend’s Greek grandma floated whole leaves on top of her summer jelly. I wonder if you could substitute rose geranium for roses in other kinds of jams, as well. I guess I’ll have the entire summer to find out! but who in the world would blog while there’s still crumble left?